View More In Desk Calendar Refills. 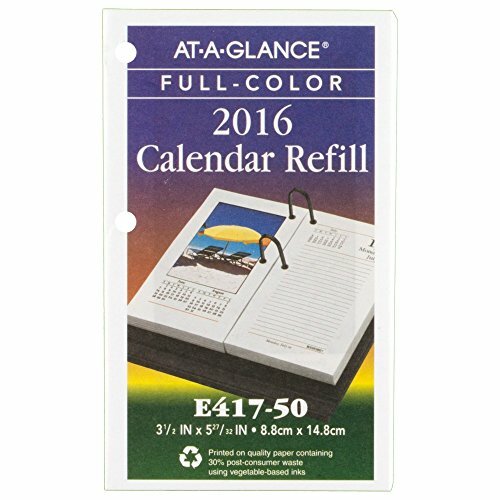 AT-A-GLANCE Recycled Daily Photographic Desk Calendar Refill is sure to help keep you up-to-date and organized all year long. Covers 12 months January – December for year long planning. Features beautiful full-colored pictures each weekday to help brighten your day. One ruled page per day with Saturday and Sunday combined for detailed scheduling. Past, current and future months reference. Printed on quality paper containing 30% post-consumer waste. Fits standard 17 Style 2 ring bases. Each page: 3.5 in. x 6 in.. Overall size: 3.5 in. x 5.88 in. x 1 in.. If you have any questions about this product by At-A-Glance, contact us by completing and submitting the form below. If you are looking for a specif part number, please include it with your message.